Currently two projects in the upland North Independent Streams Basin are implementing the Upland Nutrient Reduction Strategic Plan. Muddy Creek in Tippah County failed to meet minimum water quality standards for aquatic life support, most likely due to organic enrichment/low dissolved oxygen and nutrients (nitrogen and phosphorus). This led to a recommended reduction of 45-70% of nutrients in stormwater runoff. 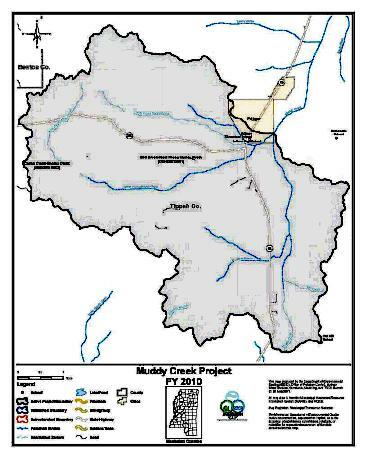 MDEQ is partnering with MSWCC, USDA NRCS, USEPA and the Tippah County Soil & Water Conservation District to install appropriate BMPs on the targeted farmland area in the Bell Creek-West Prong Muddy subwatershed (HUC #080102070601) of the larger Muddy Creek watershed. USGS is tasked with water quality monitoring for the project. MDEQ is conducting a similar project with the Alcorn County Soil & Water Conservation District, MSWCC, USDA NRCS, USEPA and USGS in the Tarebreeches Creek-Tuscumbia River Canal subwatershed (HUC # 080102070503). 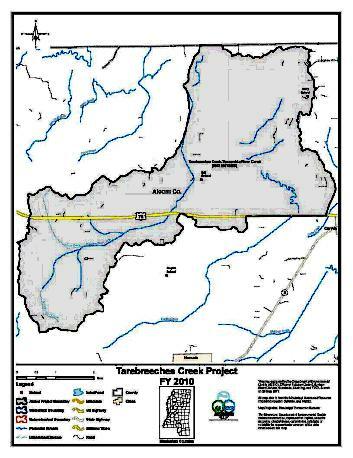 Tarebreeches Creek-Tuscumbia River Canal Watershed is biologically impaired due to pollutant loads and is not meeting the watershed’s designated use classification of aquatic life support. Here, as in the Muddy Creek project, best management practices address nutrients (phosphorous, nitrogen), and sediment reduction. For additional information on these projects, please contact Janet Chapman, MDEQ Basin Management Branch, at (601) 961-5266.